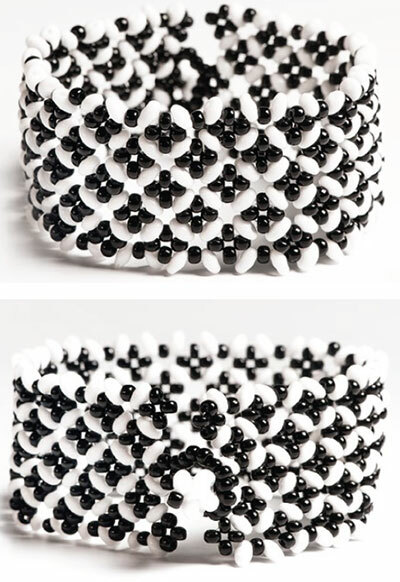 Preciosa Ornela presents another tutorial for the creative use of the unique seed beads Preciosa Twin™ and Preciosa Solo™, two hole seed bead, this time in a classic black and white color combination. Using the unique two-hole seed beads Preciosa Twin™, it is possible to create a flat pattern with a highlighted color contrast relatively simply. By repeating it, you can create any surface or strap and use a decoration or an appliqué as a costume jewelry accessory. If you have not yet tried this two-hole seed bead, have a look at this tutorial for an elegant bracelet made of seed beads with the Preciosa Traditional Czech Beads brand. It is possible to use supplementary Preciosa Solo™ beads in the same size, but with only one hole for the outer rows. If you have yet to try these beads and seed beads which supplement one another excellently. Preciosa Ornela wishes you many creative experiences with seed beads from the Preciosa Traditional Czech Beads brand. Begin the stringing with a so-called stop bead. On the needle and line gradually string a figure consisting of 3xR, 1xT, 1xR and 1xT onto the needle and line and then repeat according to the required size of the bracelet (fig. no. 1). Seventeen figures seed beads have been strung together on our bracelet. String 4xR after the last seed bead and pass the line through the R before the T. Then add 1xT, 1xR and 1xT and pass the line through the first rocaille in front of the Twin, add 1xR and pass the line through the third rocaille. Continue in this way until the strap has been created (figure no. 2): add 1R at the end of the row, thread the line through all four rocailles one more time and tie off both ends with a strong knot. You have now sewn the initial row of the future bracelet. Sew the second and third rows on one side of the basic strap and then repeat the same on the other side. 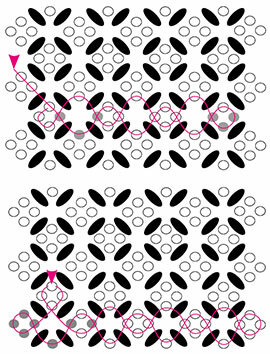 Add 1xR, 1xT, 1xR, 1xT and 1xR in the next row and pass the line through the seed bead between the T in the initial row. Continue in this way along the entire length up to the end of the row. Then pass the line through the last seed bead between the T, string 3xR and pass the line through the T, R and T in the initial row. Repeat this procedure along the entire length (fig. no. 3). Sew the third row similarly to the second, but at the beginning pass the line through the T and string 4xR. Pass the line through the first strung seed bead, then string 1xT, 1xR, 1xT, 1xR and continue as in the second row. It is possible to use Preciosa Solo™ beads instead of Twin beads in the row. You now have a sewn bracelet and you need to put together a ''ball'' for the fastening. String 4xT and tie them tightly in a circle, then pass the line through the second hole of the T and string 1xT. Repeat this three times. Pass the line through the second hole of the T and connect all of the strung T and sew them up so that the ''ball'' is strengthened (figure no. 4). Sew the ball onto one side of the bracelet. Create an eye from the strung seed beads on the other side of the bracelet.